ACRL invites applications for the 2017 Information Literacy Immersion Program. Monday, December 5, 2016 is the deadline to apply to Immersion ’17 (Teacher and Program tracks). The ACRL Immersion Program provides instruction librarians the opportunity to work intensively for several days on all aspects of information literacy. Whether your institution is just beginning to think about implementing an information literacy component or whether you have a program well under way, the Immersion Program will provide you with the intellectual tools and practical techniques to build or enhance your institution’s instruction program. 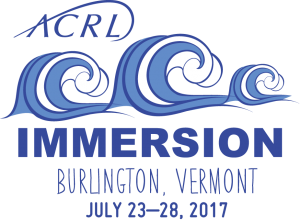 Immersion ’17 (Teacher and Program tracks) will be held at Champlain College in Burlington, VT, July 23-28, 2017. Acceptance to Immersion ’17 is competitive to ensure an environment that fosters group interaction and active participation. Applications are due December 5, 2016. Complete details and application materials are available online. Questions about ACRL Immersion ’17 programs should be directed to Margot Conahan at mconahan@ala.org.